In deze mail staat een link waarop het zevenentwintigste DKARS-Magazine is te downloaden. This mail contains a link which the 27th- DKARS-Magazine is available for download. select from the menu on the left side of the page. Simply Call "CQ BR" so folks know you are a Bug Roundup Participant. Grab that bug, clean those contacts, and let’er fly! Let’s hear that “Banana Boat / Lake Erie Swing" or that commercial KPH/WCC quality fist. For more information and to help assist in spotting, potentially increasing QSOs, an On-line chat window will be available at the bottom of Bug Roundup home page located at the URL above. The semi annual Bug Roundup event is a lot of fun. 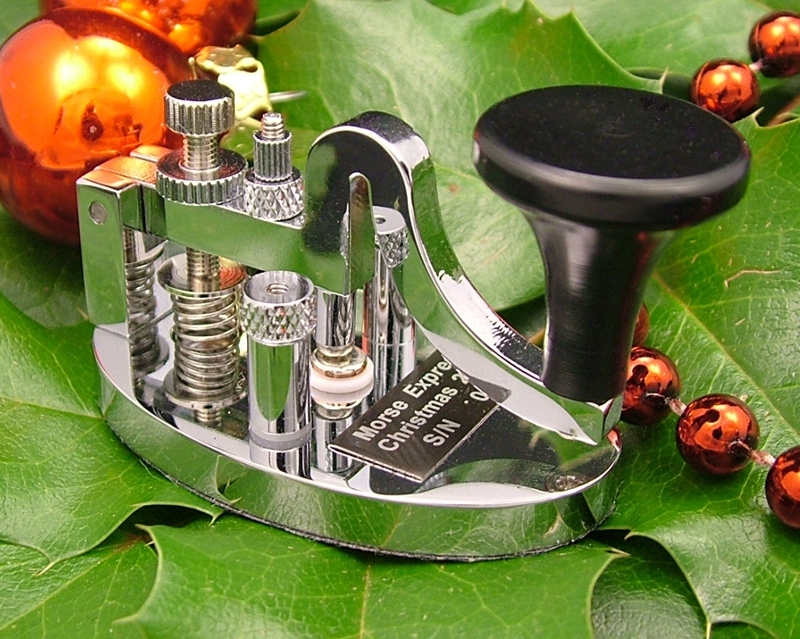 There are people from all around the world that enjoy getting on the air with their Bug Style keys, calling "CQ BR" to have a real QSO and not just exchange signal reports. The purpose of the CQ BR event is to give the opportunity to those that have a Bug Style key a chance to make use of it. Especially those who have not been on the air with their bugs in a while. Although we do not discourage or stop those who have only a straight key, it really isn't the focus of this 'straight key' type of event. Maybe this event will encourage you to pick up a nice second hand bug and give it a go? The link in the announcement was changed some how by Yahoo when posted. For some reason the top link worked fine, but the bottom one dropped off the .html ending. Once again, the complete website address for more information (and some pictures) is located at the URL above. Remember, there's a great 'spotting' chat style page there so you'll always be able to find someone on the air. I used a VF1 with a DX20 about 52 years ago ! In the past, yes, Bob. We used the VF-1 to drive several different crystal controlled rigs. What we had to watch was the supply Voltages. My DX-20 & DX-35 did not have stable enough power supply. I ran mine off a dedicated PS I built. Oh, for what it is worth, the VF-1 is what is in the DX-100s, also. Yes, the DX-100 used the same basic circuit, but the 6AU6 VFO and its 12BY7 buffer stage had their plates supplies regulated by a 150 Volt 0A2 regulator tube. That is why a lot of folks used a separate regulated power supply for their VF-1s. With my DX-40, I used a Knightkit V44 VFO which had its own built-in regulated power supply. Gotcha beat John – got my VF-1 in early 60s (61 I think). Though I had died and gone to heaven after operation with two 80 meter crystals and one 40 meter crystal (with a strapping homebrew twelve watt xmtr). I remember my VF-1 had some sort of instability (ground problem maybe?) such that when I moved my hand close to the case, the freq would shift! Yep Dave, my Novice and early General station was a matrix of homebrew stuff lashed together. I bought my VF1 in 1957 and it had an 0A2 built in regulator, but took the voltage from the DX-35. Unfortunately the series resistor was too large and the 0A2 stopped firing when the key was down. It had a lot of chirp and some drift, but was good with as little chirp and drift as any VFO after the resistor was replaced with a lower resistance. I remember it well because it was my first of many design changes. I am afraid the VF! got a very poor reputation from this and suffers to this day. I have three and an HG-10 which I have acquired recently, but have not tried as yet. The voltage supply from the Viking Adventurer is sufficient that there is no chirp and this one is stable. Just won't drive the Adventurer. Is anyone interested in this key? I bought it new and never used it. My email is valid in qrz.com. Scientists have used Google Glass to teach people Morse code within four hours using a series of vibrations felt near the ear. Participants learned it without paying attention to the signals — they played games while feeling the taps and hearing the corresponding letters. After those few hours, they were 94 per cent accurate keying a sentence that included every letter of the alphabet and 98 per cent accurate writing codes for every letter. Researchers at the Georgia Institute of Technology in the US decided to use Glass for this study because it has both a built-in speaker and tapper (Glass’s bone-conduction transducer). The taps were created when researchers sent a very low-frequency signal to Glass’s speaker system. At less than 15 Hertz, the signal was below hearing range but, because it was played very slowly, the sound was felt as a vibration. Half of the participants in the study felt the vibration taps and heads a voice prompt for each corresponding letter. The other half - the control group - felt no taps to help them learn. Participants were tested throughout the study on their knowledge of Morse code and their ability to type it. After less than four hours of feeling every letter, everyone was challenged to type the alphabet in Morse code in a final test. The control group was accurate only half the time. Those who felt the passive cues were nearly perfect. “This research also shows that other common devices with an actuator could be used for passive haptic learning,” said Thad Starner, professor at Georgia Tech. I wrote this memo for future reference if my TS-480SAT has a relapse. I thought this might be of interest to other TS-480SAT/HX users as well. 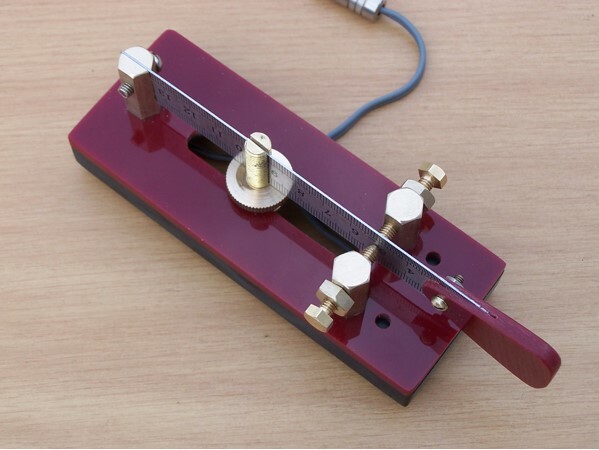 80m band brought back to life on TS-480SAT. Just after an automatic antenna tuning on 80m, the whole segment 2.5 - 4.7 MHz disappeared, no RX. The procedure described below solved the problem. 1. Save data: Memory, Menu, and Auto Mode frequencies with KENWOOD Radio Control Program ARCP-480. - Rig ON; Menu 56 PC data rate COM port communication speed: 9600 bps; Rig OFF. - Connect PC to rig, here USB-to-serial adapter + F-F DB9 RS-232C straight cable (straight = cable pin 1 to 1 etc., ignore PC/rig socket layouts). - ARCP-480, Menu Control > Set up..., select COM port and Baud rate: 9600 bps. - Rig ON; ARCP-480, Menu Control > ON. - ARCP-480, Menu File > Save...; Check all checkboxes; Save the .abk file. - ARCP-480, Menu Control > OFF; Rig OFF. - ARCP-480, Menu File > Exit. 2. Firmware update and full reset procedure. 3. write the data back after firmware update and full reset, ARCP-480. - Rig ON; Check Menu 56 PC data rate COM port communication speed: 9600 bps; Rig OFF. - Connect PC to rig with RS-232C cable. - ARCP-480, Menu Control > Set up..., check COM port and Baud rate: 9600 bps. - ARCP-480, Menu File > Open...; Open .abk file, transfer data. Thank's yann for sharing your useful experience. As i am an owner of a TS480SAT, this procedure is in a safe place in case. Dear Yann and SSN friends. 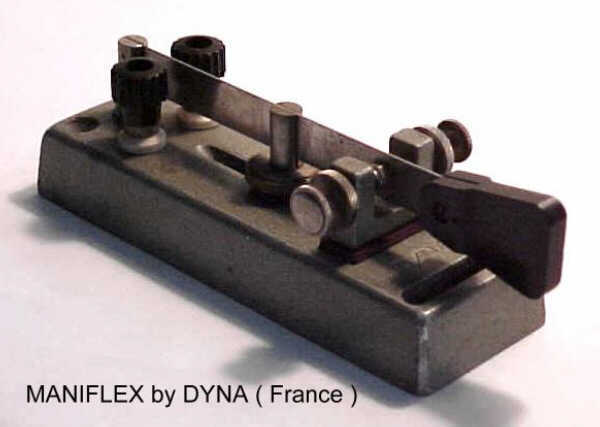 After some time using my plastic copy of the above key I find it quite a noisy key to operate and I got to thinking that maybe the real Dyna Maniflex keys, being like an upturned metal bath/trough might be the same. You might try using a flexible contact strip like I use on my keys. The Twanger also used the same contact strip arrangement and it makes the key very quiet. You are right Martin and I'm sure your version of the Maniflex is quieter than the original one. Yes, the molded metal base really looks like an upturned trough and acts a bit like a resonator. This isn't a real nuisance but if one day I mount the key on a flat base I would fill up the hollowed base with foam or a similar material, leaving a gap for the sliding post screw. As Steve mentioned, flexible contact strips would make the action smoother and quieter although the clickety-clack isn't too disturbing. FYI, on some keys a hollowed base was used as a resonator to monitor one's sending. I have an old French training key (end of 19th century) having a cast iron base that rings hollowly when used. Thanks fellows, keep up the good work, BCNU.